Two levels of action packed workouts, nutritional guidelines, goal trackers, and all around badassery for 20% off. Action Hero up and sculpt your amazing body in just 8 weeks! 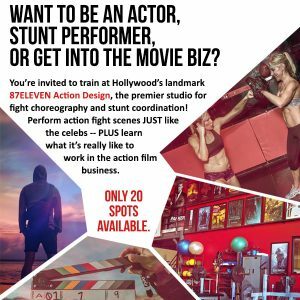 The Action Star Workout Program is one of the most cutting edge, unique workout programs on the market. Shred and tone your body while escaping into the amazing world of an action hero with high intensity cardio in the form of film fight scenes. No other fitness program provides you with complete fitness in the form of body sculpting, muscle lengthening and balance training, with the added intensity of action film based cardio fight scenes. Escape into our fun filled world of action heroes and before you know it, you will feel like you can scale a building, sprint from an explosion, or hang off the skid of a helicopter ready to attack every challenge that comes your way!!! !